I recently reorganized my kitchen pantry as part of my fall cleaning routine. It wasn't a fanfare filled activity. It didn't require hours of my time or any great skill. I didn't call my family over to witness the result of my hours of toil, because, honestly, there wasn't any. I simply cleaned out the pantry, the same way my mom did every so often when I was growing up, the same way I do now whenever it needs. The same way most people do, when their food stash gets unruly. Sort of like The Whos from Whoville on Christmas Day. It was done without ribbons. It was done without tags. I organized that pantry without labels, or canisters, chalk or pretty bags. There was no dramatic makeover and besides the old contact paper lining on the shelves, there's nothing remotely attractive about the space. At all. The process didn't require a detailed tutorial. I just checked the food to see if it was expired, wiped down the shelves and put everything back in a little neater than when I took it out. That's it. 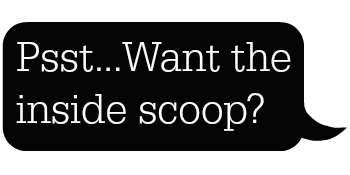 That's all I did, very uninteresting, very uninspiring and certainly not worthy of a blog post. And yet that's what real life is all about most days. Not every one of my DIYs results in a photo-worthy reveal, nor should they. Sometimes I wonder how helpful it is to feature these super styled spaces and renovations all the time, what kind of expectation it sets up for non-blogging readers. And bloggers themselves for that matter. We tell our audience to decorate that room, make that craft or get organized and then we show them these unbelievably gorgeous staged finished products and say, "Okay, now yours should look like this, it's easy!" Or is it? Well, I guess for some people it is, but certainly not for everyone. I'm one of only two home bloggers that I know in real life, so when I get together with friends and the blog comes up, many, if not most of them say, "I could never do that" or "I put the job off because mine will never look like that." Reading so many visually appealing decor blogs every day, it's easy to forget that without some decent DIY skills, a lot of time, free supplies from sponsors and, let's face it, money, many of these projects are unattainable. And sometimes, dare I say, unnecessary? Just like my reorganized bathroom, my pantry will never win an award for great design, its pleasing aesthetics or innovative style, but it doesn't need to, it's functional. I won't overbuy, I'll be able to plan my meals more efficiently and my kids will stop saying there's nothing to eat in the house since everything back in plain sight. 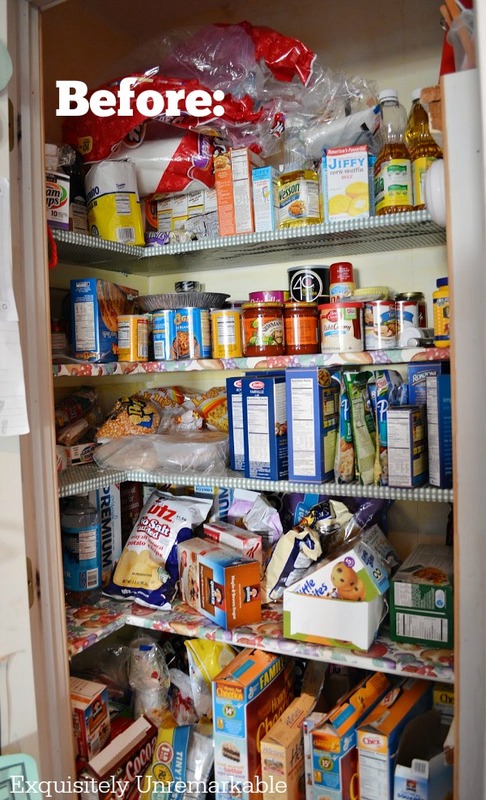 Of course, my pantry is just a metaphor for any number of projects that show up in your feed each day and don't get me wrong, I'm just guilty of it as the next guy. I'm clearly a design perfectionist, I like things to look a certain way in my home and I enjoy sharing....and even though super easy crafts and quick home decor tips are my main my focus, I'll continue to share my more involved projects ~ partly because it's what's really going on around here and partly in hopes that someone may find inspiration or a solution for a DIY they may be contemplating. However, if you're a longtime reader, I sincerely hope it's been noted that even I don't do a lot of my own easy DIYs, on my own. Sometimes, I'm just the idea girl. I have a enormously handy husband who loves creating as much as I do, but without him, simple tasks like spray painting, nailing, drilling, cutting wood?? No way. It's not in my wheelhouse and it's never going to be. Give me a glue gun or paint brush and I'm your girl, more than that and it's probably beyond me. You see, even the words simple and easy are all relative. 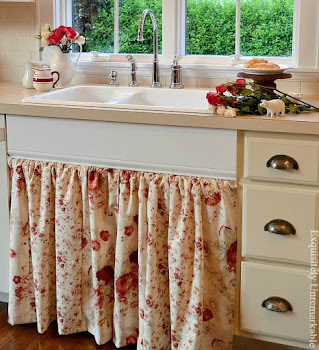 So today, instead of showing you magazine styled shelves or how to get the look of my walk in, color coordinated butler's pantry, I am simply encouraging you to tackle a small project on your own to-do list and feel great about just getting it done ~ no judgement, no comparisons. Your result doesn't need to look like it belongs in a book, it just needs to work for you. And I hope that's how you feel about all the DIYs and crafts I present, because that's the spirit in which they are shared. Seriously, I will never have the prettiest pantry on the block, especially with that ratty contact paper, but my boring little fifteen minute update will save me money and make mealtime a bit easier this week. That alone is totally worth the time and effort. And absolutely anyone can do it. Even you. And you. And you. 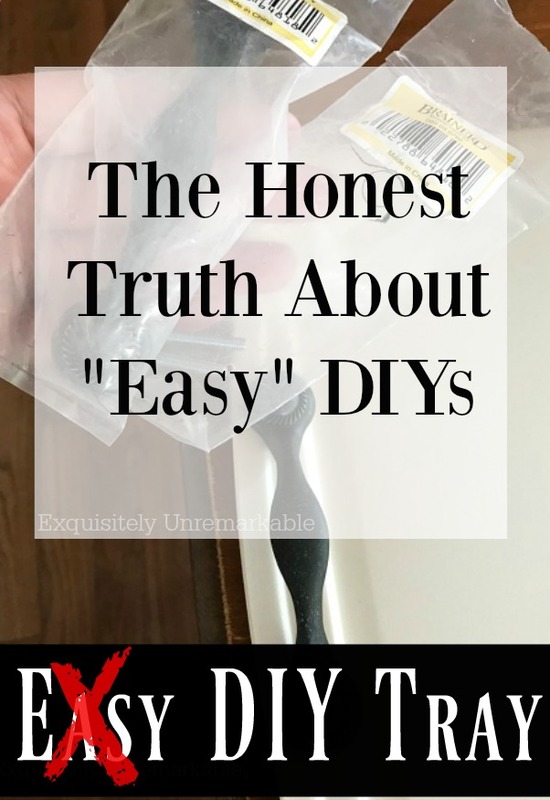 What are your thoughts on "easy" DIY? I'm with you, Kim! I've been blogging a long time, and I've seen what your talking about. I see bloggers having to buy a 'project house' because they've run out of things to do at their own house. I see every area perfectly styled - though we know that's not reality. 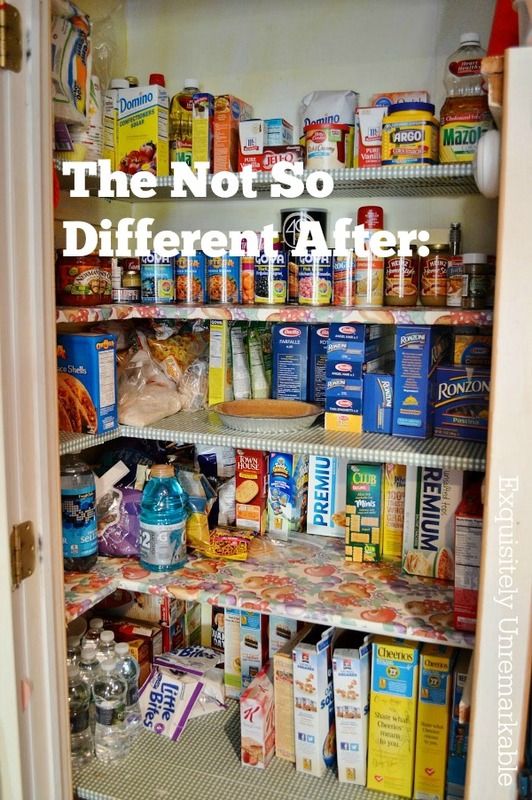 I love when people share, like you did, a simple "Hey, I straightened out my messy pantry." Its real life. I put shelf paper in my refrigerator yesterday. It looks nice, but and is helpful, so I may share a photo, but there are no bells and whistles. Don't get me wrong I love a good before and after. I'm able to do nice things, but I think we need to show the everyday as well. That's where inspiration happens for everyone, "Hey, I could do that!" My sentiments exactly! Thank you for this one! Thanks Linda...I appreciate your taking the time to read it. Thank you so much for your honesty! It is so easy to fall into the trap of comparing ourselves to others and then feeling that we don’t measure up. Thanks for encouraging us to be content with who we are and our own abilities! Thanks so much!! This one has been on my mind for a long time...I think decorating your home, crafts and DIY should be a fun experience and not an angst riddled, pressured hobby. I'm glad to hear I'm not alone. I appreciate the time you took to visit and leave a comment. I've written a blog post about such things many times. I don't monetize my blog - its just a way to chronicle our life at home. But its fun to me to look back over quick projects like that where I got HUGE satisfaction. And it inspires me to tackle it more often, which I do. Plus, its just plain smart and frugal to clean and reorganize the spaces in our homes, especially the kitchen! Totally agree! I need to do more of this in closets and my basement. How does this stuff accumulate so quickly??? Great post Kim. While we bloggers like to show fun and innovated things we still live in our blogger homes. Sometimes things we do are good ideas and not magazine worthy but someone somewhere might just get motivated to re do their pantry. I just just cleaned out my pantry a few days ago. It is not post worthy but it gave me satisfaction to be able to open the door and see what I have and where it is. Have a great day. I don't try to keep my home as magazine worthy as I used to. Maybe it's getting older. And really, who lives like that? No one. Ha!! ☺️ Well, no one I know anyway. Totally agree. I like the way you think! We spent the first 7 years of our marriage updating an old house. When we moved here, we did most of the big stuff in the first year so we could enjoy our weekends instead of living in constant renovation. My kitchen looks the same as it did the day we completed it in 2003. I joke around that I'm going to be that lady with the really dated house, but I don't care as long as I get to spend my days at the beach. Yep! I am with you my friend. I have a similar pantry. :-) I clean it every now and then, when things get stuffed in one place or the other. Or when I need to take inventory. I like to take inventory, too, Carla...especially in the fall, when I get that baking craving!! Well I did some DIY today myself, cleaning out my summer clothes from my closet and reducing it by half and pulling a garbage bag full of old linens out of the linen closet for the garbage. Not much fun but I feel like I accomplished something, even though they are behind closed doors. That's the extent of my DIY projects these days....although I did just makeover my bathroom....reveal soon! That’s a real necessary real life DIY, AnnMarie. And I can’t wait to see the bathroom! If it's not easy, I'm not doing it! I'm far too busy to tackle anything too time consuming, and I always tell myself when I look around that I don't NEED anything else! I do worry that sometimes my pix of the same old same old house will get boring to readers, but that's my reality! Happy Weekend, sweet friend! Reality is the best, Debbie and your house is so beautiful and cozy who could ever get sick of seeing it over and over again?? Plus...those pups. I mean come on. Adorable!! Excellent advice, Mary! Life's too short to waste on things we don't want to (or have to) do. Shipping tape sounds like a great solution and one I may employ for a bit. It's still too nice outside for me to waste time inside papering shelves!! And thanks!! Clean and organized is definitely "good enough"! I have no desire for my pantry (I don't even have one - ha! So how about my cupboards?) to be magazine worthy. I love decorating and organizing, but I do it for myself and my family. And that’s just the way it should be, Melanie! I opened my pantry yesterday . . .
And said . . .
You need your cleaning . . . NOW . . . I didn’t do the clean up, organize, toss thing yet . . . I promise . . . THIS WEEK . . . I'm with you, Cheri, I say write what you enjoy and what feeds your own soul. It's hard not to get caught up in the comparison game though. I look at other people's Instagram feeds and I'm awed. Then my kids pop up and say mom, they're just better photographers than you. And they're right. So I focus on the words instead, because that's what makes me happy!! Michelle, you just made my day...smiling from ear to ear over here. I just like things to be clean and organized … and every so often have a good clean through and sort out. It certainly makes a difference, Jan! I don't know how this stuff accumulates so quickly! There must be something in the air about pantries lately. This is about the third post in as many days I’ve read about them, plus we just finished putting our pantry together too. Pantries are probably the most clutter prone areas of anyone’s home...organized one day and the next it looks like hurricane Florence came through ;). What you said about your husband is so true for me too. I’m good wiith a glue gun and paint, but power tools scare me. I keep telling myself I’ll twke a woodworking class ‘one day’, but who am I kidding?! I try to tidy up that pantry once in a while when I can't find anything anymore. I guess easy is relative as you say. For someone who has been doing DIY for a long time it might be easy, but for someone else it might look like a mountain. When I recently did the accent wall into clouds it felt like Everest to me but I was determined to get through it and I didn't even care if it was a success I just wanted to finish it. So there is that aspect as well. Thanks!! I'll take that as a compliment. Sometimes I feel the need to tell it like it is...or at least as I think it is!! I can relate--especially when it comes to Instagram and the constant stream of perfection! Thanks for keeping it real! Oh Instagram! So many pretty pictures, but I hear you...I can't keep up!